Clay and water are inseparable elements in Joel’s life. Some of his earliest childhood memories are of playing in the spring-fed creek on his farm. Digging clay from the banks and rolling coils and balls, he knew early on that his life and clay were intertwined. Coming upon large pools with gem-like quality, the interplay of riffles with sunlight, and the mystery of the spring – this is his quarry. Mechanically, spinning things has always held a fascination for him. Whether it is coins or clay, he loves to spin things. Hence, the wheel. The fluidity of clay as it is being spun on the wheel enlivens it. The subsequent drying and firing of the clay tends to deaden it. Rebirth of the clay occurs with an application of glaze and even more so with the addition of water, as a fountain or containers. 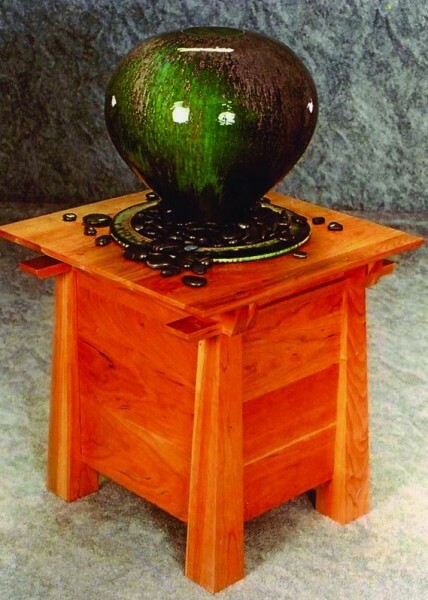 For him to create fountains and flower vessels are a natural extension of his passions.